Yesterday, Pokemon World held what may have been the country’s first ever Pokemon Go meetup. Pokemon trainers from all over New York City gathered at Washington Square Park and its famed arch to catch Meowths, Ponytas, and plain old good vibes. 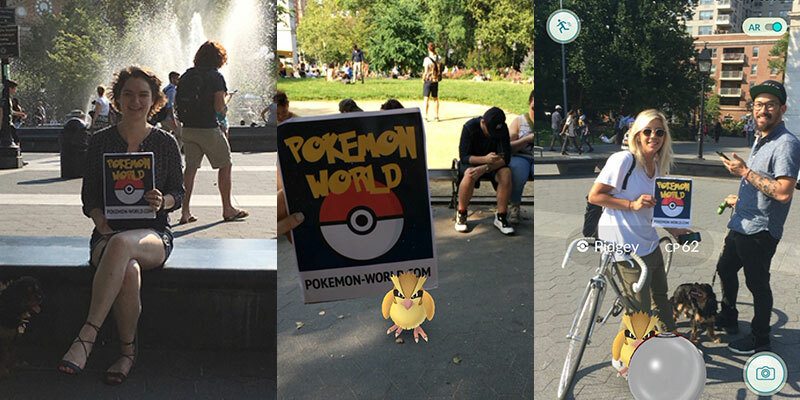 For several hours, players spent time around lured Pokestops sponsored by Pokemon World. There, they mingled and learned more about their fellow trainers. “This has been great. It’s been amazing to finally get a look at other people’s Pokedexs and get insight on their techniques.” said Pokemon level 9 trainer, Karen Baron. While some spent their time in the grass tracking, others took to the gym under the arch to unseat the current gym leader and their Vaporeon. Players even exchanged numbers in hopes of future hunts together. Speaking of future hunts, Pokemon World will sponsor its next Pokemon Go meetup this upcoming Tuesday, July 19th. The event will coincide with We Work’s Taco Tuesday located at their Soho West location where we will be buying lures for nearby Pokestops. Join us as we lure and catch Pokemon while chomping on some chips, guac, & razz berries! There will also be Pokemon Go raffles and giveaways for all attending trainers. If you plan on coming, please RSVP here. CEO Robertson Price sees the opportunity for Pokemon Go to not only be the worlds biggest game and gaming universe but also believes, with some minor technical or user driven innovations, the game could become the newest blockbuster social networking or dating/relationship app.